Dunlop has launched a brand new rapid-drying filler as an addition to its revolutionary Pro Décor range. Now available at builders and decorators merchants across the country Rapid Rescue Repair Filler with Hydroloc™ is perfect for quick fix or emergency repairs. Available in handy 1kg bags, Rapid Rescue helps decorators sort out the multitude of problems often faced before applying paint or wallpaper without having to wait hour or days to complete a job. Fully dry and hard in 90 minutes, whatever the temperature or conditions, Rapid Rescue is perfect for filling chases, cracks around doors and coving, large cracks and holes. It can be used internally or externally, on the majority of backgrounds from plasterboard to concrete steps, to reliably fill and repair damage up to 50mm deep. Unlike other similar fillers on the market, Rapid Rescue is unique in containing Hydroloc™ technology. Hydroloc works by using the mix water as part of a chemical reaction to dry the filler, compared to traditional products that dry via water evaporation. This means that the product dries evenly, regardless of thickness, throughout in record time. After 20 minutes the product starts to begin its hardening process and can be easily cut or carved – perfect for repairing a missing piece of skirting board. 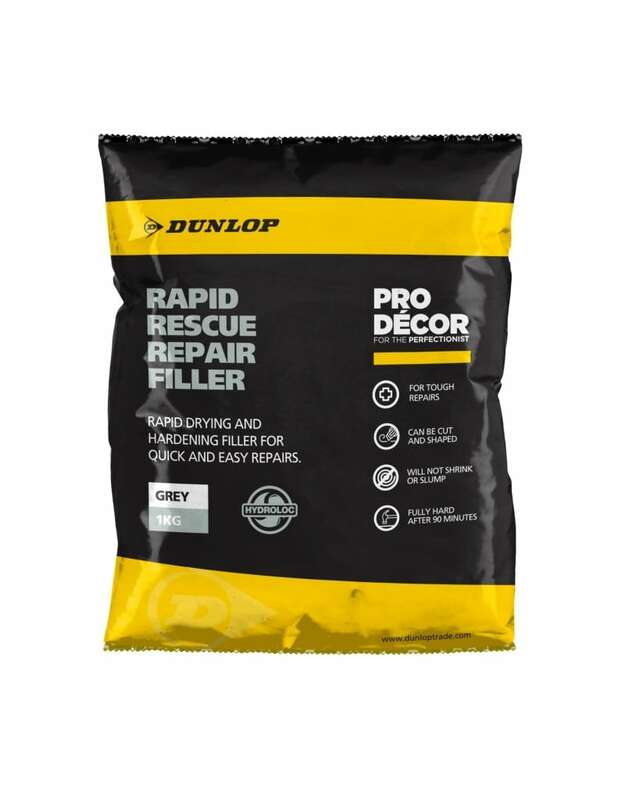 Debi Boulton, Sales and Marketing Manager at Dunlop commented: “It’s exciting times for Dunlop Pro Décor with the range being appreciated by decorators and merchants nationwide, however we don’t stand still, which is why we are launching Rapid Rescue Repair Filler.